The headlines may be full of eight-digit prices for contemporary art, but with more than two million artists working in the United States, there are bound to be some whose works would look wonderful in a home and would be affordable, too. The question is how to find them. The answer might be in an exhibition called "State of the Art: Discovering American Art Now," organized by the Crystal Bridges Museum of American Art in Bentonville, Arkansas. Before the exhibit opened last year, Don Bacigalupi, the museum's then-president, and Chad Alligood, an assistant curator, searched the country in communities large and small. They traveled to about 1,000 artists' studios, took notes and pictures, and returned to their museum to determine their selections. Intent on finding masterful, engaging, and visually appealing art, they selected 227 works by 102 artists. All—in their eyes—are underappreciated by the nation's big art market centers. Some have local followings; some not even that. Many lack gallery representation. Crystal Bridges has already purchased about 70 pieces from the show, and it may add more—which would help enable a tour of the exhibit to other museums. If you're willing to trust your own judgment, you may find artists whose works, either on view at Crystal Bridges or seen in their studios, appeal to you. Here are nine whose art—ranging from paintings to sculpture to photographs to collages--caught our eye. Wielding just a carbon pencil, Adonna Khare creates big, playful, intricate drawings, mainly of the animal world. Starting with a simple idea, she lets the tableaus evolve; part of their charm is the challenge for viewers to find the narrative threads. In "Rhinos," for example, you'll find a horn that turns into a banana, perhaps a reference to the human activity that threatens their existence. Look closer and see fish, penguins, a rabbit, and more—little vignettes everywhere. In 2012, Khare's "Elephants"—a menagerie stretching to 40 feet—won ArtPrize, a people's choice award staged in Grand Rapids, Michigan, widely called the world's largest art competition. Richly colored and densely layered, Ahuja's artworks are narrative in nature, full of mythic warriors and epic heroes, sometimes set in sensuous surroundings. She thinks of them as self-portraits—not literal ones, but rather embodying some aspect of her being in an invented practice she calls "automythography." Each piece begins with an idea of a gesture or a posture, which she performs in front of a camera. She then uses these photographs of herself to invent, draw and paint—often mixing media. Part African-American, part East Indian, Ahuja says paintings by artists from India inspire her. Several museums now own or have already shown her works, and the list is growing. Jimmy Baker's abstract Arrangement paintings are small, less than two feet square, but are so stunning that Crystal Bridges chose eight of them to display in "State of the Art," the second-most among artists in the exhibition. They are also much more than pretty. 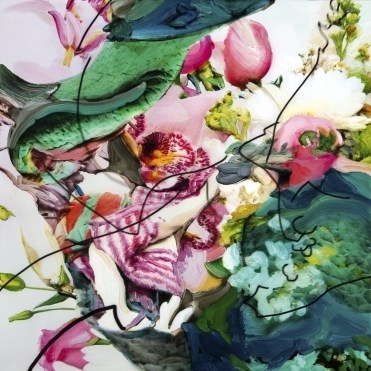 Deep in the gestural beauty are contemporary images of, say, news items or flowers. Baker begins by painting thick, highly colorful canvases, which he sends through a digital printer. Next he layers that with spray paint images gathered from the Internet or other sources, and manipulates them, removing specifics and changing their positions to make something new. The longer you look at these fascinating puzzles, the more you see. The art of cut paper is a cherished tradition in Mexico, where Catalina Delgado Trunk grew up. Turning to art about 20 years ago after a career in teaching, Delgado Trunk has become a master of the form. Her works combine the pre-Columbian imagery she admired in her youth with contemporary subjects to explore Mexican legends and history—and beyond. Her inviting Reina de la Noche stands seductively on a crescent moon, flanked by jaguars. Her Three Graces transforms those Greek goddesses via red paper on collage into Mexican beauties, one about to dance around a sombrero. Trigrillos presents four tigers, resting on stacked, leafy branches, one atop another. Each is intricate and beguiling. Isabella Kirkland's recent exhibit at the Ohio's Dayton Art Institute was appropriately called "Stilled Life," for her nature painting combine the precision of a scientist and the richness of a Golden Age Dutch floral painting. Her best works are more than pretty: each has a theme. Gone documents species that are extinct. Ascendant show species that humans have introduced into an environment, usually to detriment of native plants and animals. The flora and fauna in Descendent are in decline, possibly on the way to extinction. 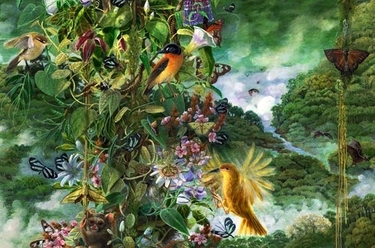 But her ebullient Emergent at Crystal Bridges depicts a colorful, little known side of nature: life in the sunny canopy of a tropical rainforest, where plants and animals thrive out of man's sight. Viewers might never guess that Miki Baird's "assemblages" and installations are photo-based. At Crystal Bridges, swatch...the weft and warp of red walker looks like a colorful, lush tapestry. Her works are sometimes woven, like baskets, say, or rag rugs. But looks are deceiving. Baird's art-making process involves taking photographs on her long walks about her hometown; in essence, she is exploring both her daily routine and recording distinct moments. She makes prints of those many images and cuts them into fragments. Then she reorganizes and reconstructs the pieces into intricate photo collages, repeating colors or patterns or textures to make pieces that are often rhythmic and always mesmerizing. When flowers die, they turn brown. When preserved, they're usually flattened. But not in the sculptures of Flora C. Mace. 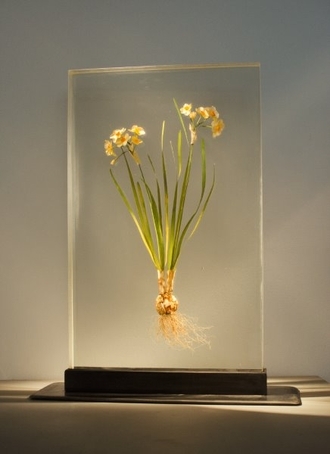 She and her partner Joey Kirkpatrick invented a technique that keeps the blooms forever young, suspended in a two-foot (or taller) glass column. Mace has a long and innovative track record in glass-blowing, and capturing the three dimensions of plants is just her latest accomplishment, achieved after years of experimentation. The Tazetta Narcissus, at Crystal Bridges, comes from a series of sculptures—each of which could anchor a room—of plants and flowers that includes daffodils, violets, ferns, orchids, irises and a tiger lily. The X-ray machine and camera are Dornith Doherty's tools of the trade in a series she calls "Archiving Eden." Doherty documents plants and seeds held for posterity in seed vaults around the world, magnifies them, adds her own collected specimens, and mixes the images to make collages that peer into nature. In a final step, she re-photographs them with a view camera, producing nearly abstract works that gently allude to humanity's uneven care for nature. An earlier landscape series made along the Rio Grande Valley—medium to large-scale close-up photographs—have even more wall power, with spare arrangement of flowers layered over a background photo of the deeply colored land, the sky or the sun. A virtuoso with wood, David Esterly carves extraordinarily beautiful still lifes, mantels, decorations, and letter racks—renderings of frames filled with mementoes that were popular subjects of 19th century American artists like William Harnett. If Harnett and others made magical trompe l'oeil paintings, Esterley's carvings go a step further in legerdemain: His Quodibet #1—chosen for "State of the Art"—is a three-dimensional assemblage of flowers, keys, an iPhone, earphones, a watch, scissors, and much more in monochromatic limewood. Inspired by an English master carver of the 1800s, Esterly gives this 17th century trade a 21st century freshness.